Lung cancer is a rather difficult form of cancer to treat. Even when discovered early, with the location of the lungs in the body, it is difficult to direct radiation towards the lungs in order to kill off the cancer and not affect other areas of the body as well. However, there are other ways to treat the cancer, depending on where the cancer cells are located. One such option is known as a lobectomy. This is a surgical procedure in which one lobe of a long is removed. In total, the right lung has three lobes while the left lung as two lobes. There are other instances where such a procedure might prove necessary, including tuberculosis, blood vessel clots around the lungs and similar issues. The doctor is usually going to discuss the condition with the patient and, if the cancer is located in the given section and has not spread, it is possible to cut this cancer out and prevent it from spreading. Lobes from the lung are removed in several different ways. 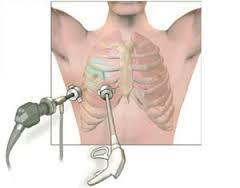 There is an open lobectomy, in which the lobe of the lung is removed through a cut through the chest cavity. There is a video assisted procedure, where a small incision is made in the chest so a camera can move towards the lungs. This results in a smaller cut, which allows the patient to heal quicker as the doctor does not need to saw through the ribs and chest bone. However, this is only a probable form of treatment if the cancer tumor is less than three or four centimeters in size. Anything larger and the doctor needs to opt into the larger method. The doctor is going to discuss the different methods with the patient before proceeding with the surgical operation of the tumor.